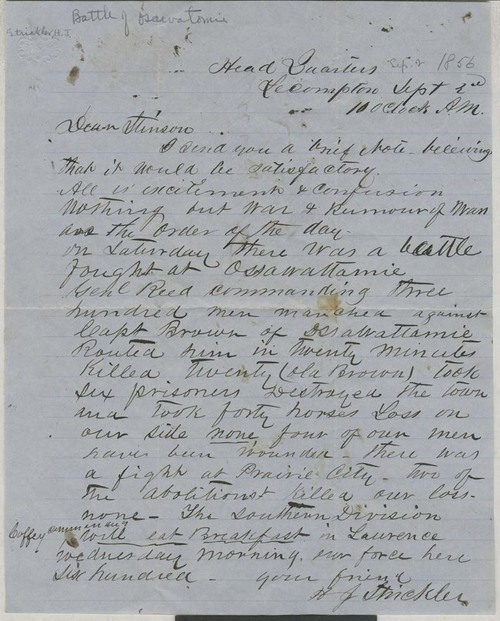 Hiram Jackson Strickler, adjutant general of Kansas Territory, writing from Lecompton, Kansas Territory, briefly described for Thomas N. Stinson the Battle of Osawatomie that took place on August 30, 1856. In the battle, pro-slavery forces led by John W. Reed defeated free state forces led by John Brown. Brown's son Frederick was killed in the engagement. Strickler's comments indicated that he held a pro-slavery perspective.